Ultrabooks and other super slim laptop computers like the Apple MacBook deliver sleek good looks. However, they usually come up short on ports for connectivity. As a result, you’re constantly plugging and unplugging peripherals to connect to the devices you need. 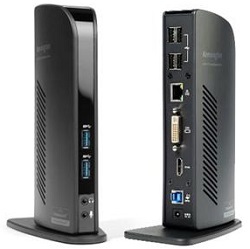 That’s where the Kensington USB 3.0 Dual Docking Station comes in. It turns one USB port into six so that with one hot swappable USB connection you’ll have access to all of your peripherals, including printer, external drive, scanner, keyboard & mouse, audio 2.0 speakers and even two 1080HD video monitors.